Even before investing in real estate or considering it, you may have heard radio advertisements announcing a national “guru’s” meeting coming to town, seen the latest no money no credit infomercial, been pitched on $25,000 real estate investment programs, and the list goes on. I have been invited to many meetings, courses, classes, groups, etc. and have learned plenty but I didn’t spend thousands to do so. I have learned that not all “gurus” are created equal. Here are a few tips to consider before attending another course or pitch meeting. Does this “guru” still invest in real estate TODAY? If they do not invest in today’s market I more than likely will not spend any money on this person. It is OK to make an exception if the meeting is free to attend to see for yourself if the info is still relevant. I personally have been in the real estate investment business for nearly a decade and the market has constantly changed. What did work years ago does not work as well as it once did. If the person does invest, do they invest in your market? It may be an informative meeting but may not be overly useful in your market. I would strongly suggest that you find a person at your local REIA that invests in your local market. I like to go to certain investor specific websites to get reviews on that person and the information they are teaching. A person cannot please everyone so expect to find negative comments. However, if the negative comments are repetitive and consistent it may be a valid negative observation about that person, his/her material, business practice etc. to take into consideration. Another item to consider is to make sure the information has not just been repackaged. There are plenty of investment courses that offer the same info with a small twist or gimmick to make it appear different. There is no need to get both. There is plenty of information about real estate investing that can be picked up from respective websites, local REIAs and local investors. These are the top items I use to evaluate a “guru” but the most important thing is to continue learning. I would advise new investors to get all the free info they can get their hands on. This will lead them to discovering the investment method or methods they will want to pursue. 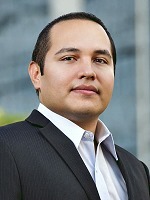 Michael Vazquez has been offering properties to real estate investors significantly below market value since 2006 in both Texas and Georgia. Michael taken on projects starting with just 4 brick walls (literally) to managing his own rental portfolio. When it comes to investing in real estate he has done much more than many twice his age. Michael is always looking for more investors to work with.